The average American kitchen is an epicenter for daily activity, it is used every day, hence the reason why they get dirty so easily and quickly. A good kitchen is a clean one, which often warrants relentless spraying and scrubbing. With all of the products used in kitchens, from cleaners to food products, finding a way for your kitchen to be environmentally friendly can be difficult-but perhaps less then you may think. Chemical-laden cleaners are some of the worst things for the environment, synthetic mixtures are effective cleaners, but harmful to nature. Simple nature-friendly substitutions such as lemon juice, vinegar, baking soda, and toothpaste are effective home solutions, not to mention the multitude of all-natural cleaners available due to growing demand of safe and natural products. The dishes and utensils in kitchens often contain plastic, and/or synthetic, harmful compounds. This is an easy fix. Substitute plastic dishes/storage containers with those made of wood, bamboo, metal, glass, or porcelain, just to name a few. Not only do these materials la st just as long as plastics, they look nicer and are environmentally friendly. 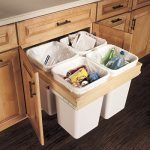 Recycling is one of the most beneficial things you can do in your kitchen to help the environment. Plastic packaging and metal containers take massive amounts of energy to simply make-pair that with billions produced each year. It really adds up, using up resources over and over. An easy and incredible effective way to help alleviate the effects of this is to recycle. Repurposing metals and plastics to be used again saves huge amounts of energy, saving a trip to the dump, and saving the Earth. Used for nearly everything in the kitchen for cleaning and eating are paper towels. They wipe up messes, clean stoves and counters, and provide a napkin for eating. Hundreds of paper towels are used by the average family every month. And what else does paper come from, but trees. It may not seem like a lot, but those hundreds of paper towels every month accumulate. Factor in almost every family in America, and you have 300 million people’s worth of paper towels used. That adds up to about 13 billion pounds of paper towels per year in the US alone. It takes about seventeen trees to make a ton of paper towels, so around 110 million trees are cut down each year for paper towel use-just paper towel use. You could use a cloth for cleanup, but they get smelly after a few uses, and takes energy to effectively wash and clean them-oftentimes it’s more environmentally friendly and effective to just use paper towels! However designated sponges and cloths for cleaning purpose work incredibly well. Personally, DURAFRESH cleaning cloths are one of my favorites. They are all natural and are made from wood fiber, which allows them to be reused over and over. Also, after running under water they are 99.9% germ free. 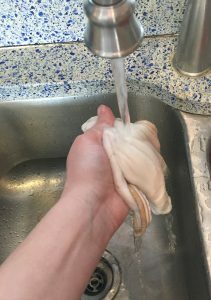 One of the best features is the sheer ease in using the product, using it with just water to wipe, and then rinsing it with water again is sufficient to stop icky bacterial growth on it (unlike your normal household sponge). 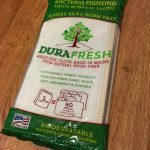 When I first pulled out the DURAFRESH cloths from the package that were very stiff and I was a bit apprehensive- these cloths are really go to soften up and clean? Once put under warm water they softened right up. It seems they get softer every time I put them through the laundry too. If you really want to go green in the kitchen, you have to rethink your strategy. Simple substitutes and healthy habits are all it takes to help the environment while also being safer and healthier for your family. This entry was posted in Blog and tagged durafresh towel, go green, green team reviews. Bookmark the permalink.